Like just about every other industry today, the construction industry is changing and being shaped as a result of new technologies. Long gone are the days when all construction workers had to rely on were a dog-eared set of blueprints and an assortment of handheld tools to transform their truckloads of rudimentary raw materials into a structure capable of offering all the modern comforts to its inhabitants. Updates and upgrades in computer-based applications, as well as advancements in chemical engineering, mean that today’s construction industry is more reliant on new technology than ever before. While it may initially seem that the emerging and evolving role of technology in construction would appeal only to those in the building sector, that couldn’t be further from the truth. As construction practices adapt the latest technology, possibilities open up for better structures built more efficiently and with fewer errors — something that benefits all of us. Read on to learn more about how the latest technologies are impacting construction. One of the most significant uses of technology in the construction field is BIM, or building information modeling. This is powerful drafting and collaboration software that creates the most highly accurate virtual building models that construction teams have ever had. The digital prototype also serves as a library of information for the design, construction, and maintenance of a structure, and one can be created for buildings, bridges, tunnels, roads, and just about any other type of infrastructure project. What BIM essentially does is build the entire project digitally, from start to finish, before a construction team lays the first beam. And unlike the more traditional blueprints and artist’s sketches that preceded construction, BIM prototypes are full 3D renderings, allowing contractors, builders, and anyone else to have a virtual walk through of a project, complete with details on every last component. Information on interior walls and exterior surfaces, doors and windows, and even things like plumbing fixtures and major appliances can all be included in BIM renderings. 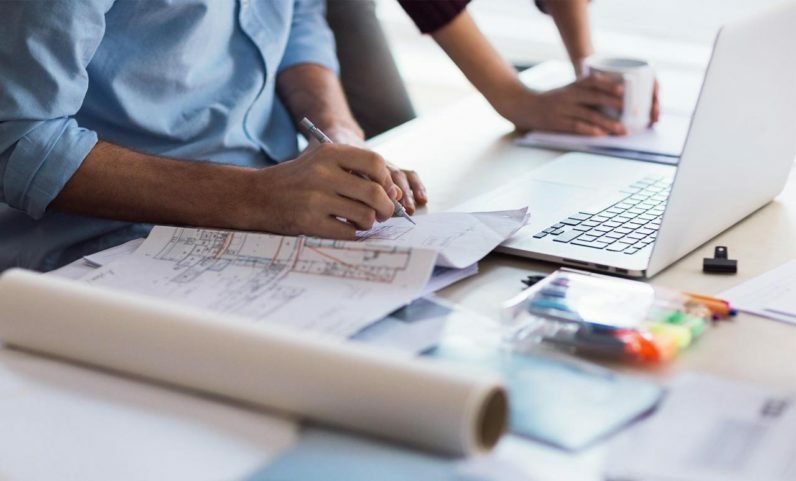 The significant benefit of BIM, aside from providing a true sense of what a completed project will look like, is that it greatly minimizes the likelihood of making any costly errors during the construction process. Additionally, it allows just about all of the layout and design decisions and changes to be made before construction even begins. The biggest threat to the utilization of BIM is the lack of skilled talent. According to Jose Cruz, Director, Virtual Design and Construction at New York-City based UA Builders Group – a leader in the implementation of BIM technology, “While there is no shortage of BIM tools, there is, however, a severe shortage of skilled talent to utilize them. Some new developments in materials science could have big implications on the future of the construction industry. For example, ordinary concrete is used for a variety of building applications, from foundations to flat surfaces, but it’s often prone to cracking, and if it’s not put down correctly, water can pool on its surface. However, a new self-healing concrete that uses bacteria to seal cracks without any intervention is in the works. A permeable concrete that allows water to drain through it rather than pool on it is also being developed. Other new materials are in the early stages of development, such as a transparent aluminum, which offers the appealing aesthetics of glass but the strength and durability of metal. Transparent metal technology is also being used to create transparent solar panels, for eco friendly energy without large, unattractive black rectangles on the roof. 3D printing technology is also moving into the housing and construction sectors as a response to the demand for affordable housing. A handful of startup companies located all over the world advertise that they can 3D print a house in about a day at a cost that’s significantly less than that of traditional construction. Augmented reality, or AR, will likely have a bigger role in construction. Unlike VR, or virtual reality, in which a person’s entire field of vision is replaced with a rendered environment, AR places images over what’s actually in front of a person. Used in construction, an AR wearable could provide what amounts to a 3D blueprint to workers as they’re on the job. Think smart safety goggles like Google Glass, or smart helmets with a combination visor-screen, and you’re on the right track. Finally, as drones become more affordable and easier to use, look for them to be used for surveying purposes, especially for larger commercial projects on previously undeveloped land. That’s because drones can quickly and more efficiently gather complete information on a job site. Because technology is never truly at a finishing stage, its role in the construction industry will continue to grow and evolve. It’s entirely likely that the new technologies mentioned here will become commonplace in just a few years, and it’s also possible that further developments in wearables and robotics will have a heavier influence in the sector. The only thing that’s for certain is that as technology advances, so will the industry as a whole.